Today Is Columbus Day. Do You Know Why? 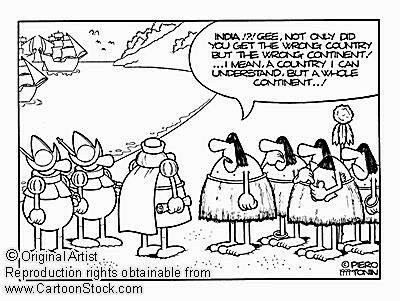 Christopher Columbus was commissioned by the Queen of Spain to go to India. He missed his target – by a lot. And now we have a day in October when we observe that mistake. Ahh, America; there’s nothing like rewarding idiots. Though not the first to reach the Americas from Afro-Eurasia — preceded some five hundred years by Leif Ericson, and perhaps by others — Columbus initiated widespread contact between Europeans and indigenous Americans. Severely underestimating the circumference of the Earth, he hypothesized that a westward route from Iberia to the Indies would be shorter and more direct than the overland trade route through Arabia. If true, this would allow Spain entry into the lucrative spice trade — heretofore commanded by the Arabs and Italians. Following his plotted course, he instead landed within the Bahamas Archipelago at a locale he named San Salvador. Mistaking the North-American island for the East-Asian mainland, he referred to its inhabitants as “Indians”.